You Are Stealing Our Future: Greta Thunberg, 15, Condemns the World’s Inaction on Climate Change | Democracy Now! AMY GOODMAN: And we are going to end today with the words of 15-year-old Swedish climate activist Greta Thunberg, who addressed the U.N. plenary session last night. 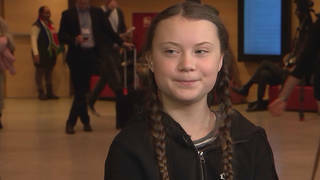 GRETA THUNBERG: My name is Greta Thunberg. I am 15 years old, and I’m from Sweden. I speak on behalf of Climate Justice Now! AMY GOODMAN: You have just been listening to 15-year-old Swedish climate activist Greta Thunberg addressing the U.N. plenary last night. She has called for a global school strike on Friday. That does it for our show. A very special thanks to Democracy Now!’s Mike Burke and John Hamilton and Sam Alcoff and Libby Rainey.